Our School comprises of a vibrant mix of students studying undergraduate, postgraduate, doctoral and short courses across a range of Fine Art and Design disciplines. 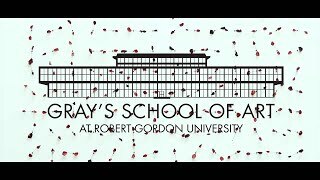 Gray’s School of Art is an influential multidisciplinary Art School that has been leading and defining culture and industrial development for over 130 years. Our undergraduate, postgraduate and short course portfolio covers a wide range of specialist subjects found within the breadth of Fine Art and Design disciplines. You will have the opportunity to specialise and focus your study within your core discipline area; our provision enables you to explore the boundaries of your subject and customise your learning experience thus allowing for greater creative diversity and development of your expertise. We believe artists and designers learn and grow in a nurturing environment that promotes close working relationships between students, staff, alumni, institutions and business. Our teaching is student centred; you will learn through doing, thinking, challenging ideas and asking questions, not by routine. We understand the importance of digital and emerging technologies in equipping you for future working environments, and we also respect the need to learn the traditional skills that underpin creative disciplines. Within our undergraduate and postgraduate courses, the staging of exhibitions both within the School and at external venues are key activities in developing your professionalism and traditional, digital and presentation skills. You will have opportunity to experience other creative learning environments and cultures through international field study visits, international study exchanges with our partner colleges across Europe, Canada and the US and work experience across the Scottish Highlands and the UK’s major cities. Our curriculum is informed by our challenges within society. Staff research and core lecture programmes and projects explore themes such as sustainability and our environment, community and social cohesion, and health and well-being. You will explore contemporary art and design practice through the lens of their societal impact, philosophical and political value, and through knowledge of their historical and emerging futures. Our graduates use their entrepreneurial skills, subject and technical expertise to develop their own businesses, apply for funding opportunities, study for higher degrees, and collaborate with practitioners from other disciplines and agencies to develop new ways of working within the creative economy. Our commitment is to excellence, and in being the most supportive and nurturing multidisciplinary Art School we can be. We believe that artists and designers change the future, so we educate you to think flexibly, critically, and expansively to take on new ideas and challenges. Through our work we develop your creative confidence, and you develop your creative identity. Our graduates are amongst the most successful art and design graduates in the UK in gaining full employment, currently standing at 97% (HESA published 2018). Our Short Course Programme caters for more than 600 part-time students each year and continues to build in strength and popularity. Whether you are interested in a 40 hour evening/day course or shorter workshops over a weekend, we have a diverse range of subjects and opportunities to choose from. Creative enthusiasts, portfolio builders, teachers, students and practicing artists all participate to form a thriving artistic hub of personal creative development and exchange. Whatever your level of experience, we offer excellent support, facilities and course content to keep your fine art or design study moving forward. Our learning environment reflects our emphasis on experiential learning and critical reflection. Our students have access to dedicated studio spaces and a full range of analogue and digital workshops. These include a photographic darkroom and studios, ceramics and jewellery workshops, digital video editing lab and printmaking and fashion manufacturing facilities. These facilities provide access to the best traditional processes as well as digital manufacturing tools such as laser cutters, 3D scanners, fabric printers, 3D and direct to media printers. Get creative using our digital video editing lab and sound recording booth. All of our undergraduate courses offer industry work based placements or work experience opportunities. Our Design courses have an optional 12 week placement module in semester 2 of stage 3 of study. These placements will be with local, national and internationally based companies related to the course of study or with cultural and creative industries organisations. Our Fine Art courses offer the opportunity for students to undertake a period of work - based experience with partners and organisations from across the cultural and creative industries sector. These work - based experiences are usually 4 week periods. Placements provide you with the opportunity to use the skills you have developed while studying, build on them in a real world situation and learn from working alongside professionals. Gray’s School of Art has long established relationships with industrial partners, creative agencies, and public bodies who invest their time and support in the delivery of live project work, funded awards, and sponsorships in partnership with the School. Guests@Gray’s involves a series of lectures and seminars delivered by national and international artists and designers, writers and curators. Creative & Cultural Skills is the UK-wide sector skills council for advertising, crafts, design, cultural heritage, music and the arts. SIE works nationally to promote and support enterprise and entrepreneurship in Scotland's students. The Academy embodies a wealth of professional experience in fine art and architecture with Members taking a leading role in higher education and in many of Scotland's cultural institutions. Gray's School of Art has an outstanding record in the RSA Awards. Sponsors of the annual Gray's School of Art Degree Show. Skills Development Scotland helps people of all ages to discover their skills and develop their careers. ACES is part of a national project, supported by the Scottish Funding Council (SFC), which aims to encourage applications from pupils who are often under- represented in art, design and architecture courses at university. The Gray’s research programme is an innovative and challenging base for practice-led research, in which the application of art or design forms a significant part of the inquiry. The School is a member of the Scottish Graduate School for Arts and Humanities, that provides doctoral training, including support for practice-led PhDs. We offer research degrees part-time and full-time at MPhil, MRes and PhD level in art and design. Gray’s staff are active across a range of contemporary research initiatives and projects, locally, nationally and internationally. The school maintains active research links with key cultural organisations in the city and region, including Aberdeen Art Gallery, Peacock Visual Arts, City Moves dance agency, Grampian Hospital Arts Trust, Deveron Arts Scottish Sculpture Workshop, and Hospitalfield, Arbroath. Our staff have a breadth of experience in teaching and professional practice. The School of Creative and Cultural Business is a dynamic multidisciplinary school covering a wide portfolio of undergraduate, postgraduate and research degrees across the communication, media and digital industries. Talented fashion and textile students from RGU Gray’s School of Art have been recognised at the ‘Professional Development Award Scheme’, organised by a branch of the historical Seven Incorporated Trades of Aberdeen. Organisers have announced details of the 5th Look Again Festival programme, extending an open invitation to residents and visitors to rediscover Aberdeen through fresh eyes at the most exciting, creative and innovative visual arts and design festival. Emily Hill, who hails from Ballymena in Northern Ireland, has spent the last year embedded within Gray’s School of Art as a Painting Graduate in Residence. As she approaches the end of her time at Gray’s, Emily is set to host an exhibition of her work, which will take place from April 8 – 19.